Being organized gives me a sense of relief and peace. I can breathe a little easier when I know the briefs are in the same cabinet as they were last week and the extra toothpaste is on a shelf that I can direct Richard to when Robert is asking for more. It may sound crazy but spreadsheets make me happy. Excel is my preferred program for creating spreadsheets because it is easy to update and several worksheets can be created within the same document. For instance, I keep a distribution sheet for Robert which is the first one discussed in the video and the one that has all of Robert’s pertinent information on it. This distribution sheet is just one page of a several page Excel file that also includes a page for prior medications, all physicians and specialists, prior physicians and specialists as well as a few other pages of information. Richard also has a distribution sheet for his mom and for himself. 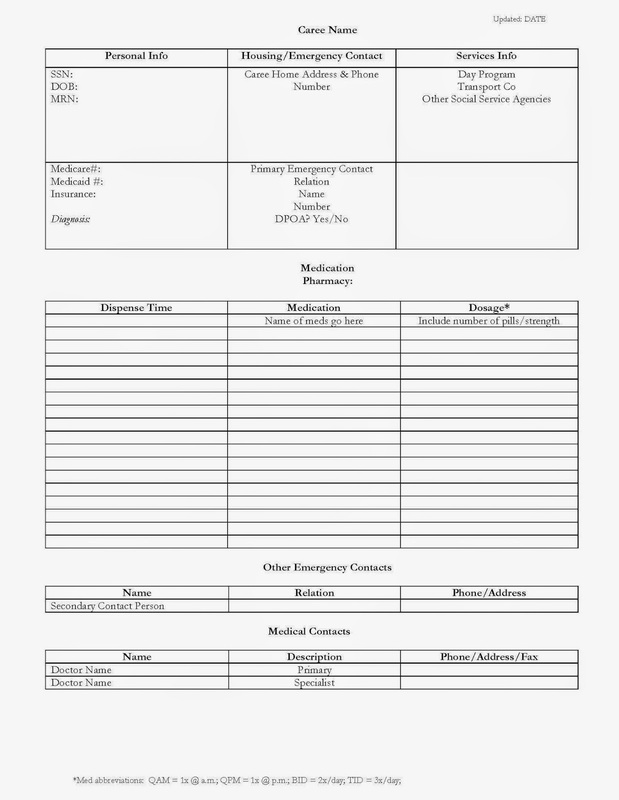 I keep several copies of Robert’s spreadsheet in my purse and at the house in the event we need a copy to give paramedics or emergency room personnel. Other spreadsheets I keep for Robert include a vitals log and an “all symptoms” log. While I know I can’t control whether Robert gets pneumonia and sepsis, I can keep track of his vitals on a daily (or more frequent) basis. Because I take his vitals daily and at generally the same time each day, I know his baseline. When his blood pressure drops or his pulse is super high then I am extra vigilant (and increase the number of times I take his vitals). The goal is to catch an illness before it gets out of control. The real goal is to keep Robert out of the hospital! I am happy to share sample spreadsheets if these would be helpful in your caregiving situation. I am a big believer in efficiency and there is no reason to recreate something unnecessarily. The samples could very simply be revised to fit your own situation. Please leave a comment if you would like a copy of any of these spreadsheets. Thanks for watching and helping to spread epilepsy awareness!